UCSC biologist Rachel Barnett-Johnson analyzed salmon ear bones to distinguish between wild and hatchery-raised fish. Photo by Libby Gilbert-Hovarth. A recent study indicates that wild salmon may account for just 10 percent of California's fall-run chinook salmon population, while the vast majority of the fish come from hatcheries. The findings are especially troubling in light of the disastrous decline in the population this year, which will probably force the closure of the 2008 season for commercial and recreational salmon fishing. The role of hatcheries in the management of salmon populations has been a contentious issue for many years. The new findings appear to support the idea that including artificially propagated fish in population estimates can mask declines in natural populations caused by a lack of suitable habitat. "Our finding that 90 percent of the fish are from hatcheries surprised a lot of people," said Rachel Barnett-Johnson, a fisheries biologist with the Institute of Marine Sciences at the University of California, Santa Cruz. 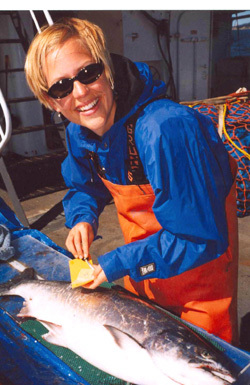 Barnett-Johnson and her coworkers published their results in the December 2007 issue of the Canadian Journal of Fisheries and Aquatic Sciences. The main focus of the paper is the development of a new technique for distinguishing between wild and hatchery-raised salmon. The researchers validated the technique and used it to estimate the percentage of wild fish among the fall-run chinook salmon caught by commercial fishing boats along the central California coast in 2002. "It's a one-time estimate for that year, and these things do change over time. But it's the most recent and perhaps best estimate we have," said Churchill Grimes, director of the National Marine Fisheries Service Santa Cruz Laboratory and a coauthor of the paper. In 2002, the fall run of chinook salmon in the Sacramento River was estimated at 775,000 adults returning to spawn, according to the Pacific Fisheries Management Council. Fewer than 60,000 are expected this year, even with no ocean fishing allowed. If the percentage of wild fish is the same this year as in 2002, it would mean fewer than 6,000 wild salmon in what has been the largest salmon run on the West Coast. The researchers were able to distinguish between wild and hatchery-raised fish by analyzing the banding patterns in fish ear bones, called otoliths. Like tree rings, characteristic light and dark bands in the otoliths reflect daily growth increments, and the width of the bands indicates growth rates. The differences observed between otoliths from wild and hatchery-raised fish are the result of differences in the availability of food at a critical transition in the salmon life cycle, when the young fish (called fry) have used up the food supply in their yolk sacs and must start feeding themselves, Barnett-Johnson said. "In the wild, they hide in the gravel until they use up the yolk sac, and then there is a period of slower growth while they learn to feed on aquatic insects. This abrupt transition and slow growth are captured in the growth bands of the otolith," Barnett-Johnson said. "In the hatchery, there is an abundant supply of food, so the transition is smoother and growth bands are wider." Every fish, therefore, carries an identifier of its origin as a natural tag in the earbone, which has significant advantages over techniques for tagging fish, she said. Coded wire tags (CWTs), for example, have been used to mark fish for some studies. But only a small fraction of hatchery fish and even fewer wild fish are tagged or marked in California, according to Barnett-Johnson. Some small hatchery operations clip the fins of all hatchery fish so they can be distinguished from wild fish, but fall-run chinook salmon are not marked that way. As a result, there have not been good estimates of the proportion of wild fish in the population until this study, she said. "The only other estimates out there pointed in the other direction--significantly more wild fish than hatchery fish," Barnett-Johnson said. "One study used CWT recoveries from hatchery fish and estimated that 33 percent of adults returning to rivers in the Central Valley were from hatcheries. The other number floating around comes from counting the number of fish returning to spawn in rivers versus returning to hatcheries, and this estimated the number of 'wild' fish to be 3.5 times higher than hatchery returns." One reason these figures are so important is that they could affect the listing of the fall run under the Endangered Species Act (ESA). The question of whether hatcheries can help restore threatened and endangered salmon populations or if they actually harm wild populations has long been a controversial issue. It became a legal issue in 2001, when a federal judge revoked the ESA listing of Oregon coast coho salmon, ruling that the National Marine Fisheries Service (NMFS) should have included hatchery fish in the population counts. A more recent federal court ruling, however, concluded that the health and viability of natural populations should be used as the benchmark for ESA status determinations. That ruling has been appealed to the U.S. Court of Appeals for the Ninth Circuit. "The agency's policy on counting hatchery fish has flip-flopped as a result of these different legal decisions," Grimes said. "Now the focus is again on wild fish, and it doesn't appear there are many of them. That could be bad news for fishing because, if the fall run is listed under the Endangered Species Act, there would be no legal harvest." Fisheries experts blame unfavorable ocean conditions for the dismally low returns of chinook and coho salmon to rivers and streams all along the West Coast this year. In 2005, when this year's returning salmon were juveniles just entering the ocean, food production in the California Current was much lower than usual due to a delay in the wind-driven upwelling of nutrient-rich water that sustains the food web along the coast. A similar disruption of the normal upwelling occurred the following year (see earlier press release). "We expect the returns to be as bad or worse next year as they were this year," Grimes said. "The years when those fish outmigrated into the ocean were the worst conditions that we've seen in over 25 years of observing spring conditions." Compounding the situation is the degradation of the freshwater habitat for salmon in the Sacramento River and the rest of the Central Valley drainage system, he said. "There is no question that the river basin's capacity to produce salmon--the quality of the habitat--has been degraded something awful, and it just doesn't produce like it used to," Grimes said. "We have these remnant populations--that's all it is really. We're trying to manage what's left." Barnett-Johnson said the otolith technique offers a new tool for monitoring the effectiveness of restoration efforts and tracking the numbers of wild fish over time. By estimating the numbers of hatchery and wild fish independently, the technique can help to differentiate between effects on the population due to ocean conditions and those due to freshwater conditions. That's because hatchery-raised fish don't face the same hazards in the initial freshwater phase of their life cycle that wild fish do, so they would be affected less by freshwater conditions. Not only are hatchery fish protected and artificially fed in the hatcheries, they also get a free ride downstream in tanker trucks. The hazards associated with migrating downstream to the ocean range from predators to the pumps that siphon water out of the rivers for human use. "Most of the hatcheries in the Central Valley put the fish in tanker trucks and release them into the lower San Francisco Bay Delta, so they bypass a lot of the mortality that occurs in the rivers," Barnett-Johnson said. "If freshwater mortality was a key factor in population declines, we would expect to see hatchery and wild populations responding differently." Barnett-Johnson plans to use the otolith technique to track changes in the composition of the salmon population over time. Unfortunately, because her research depends on a collaboration with commercial fishermen, the possible closure of the fishery this year may mean that she will not be able to get any salmon otoliths to analyze. "At a time when we really need more information on the status of wild populations, a complete closure would mean I can't conduct my research to provide this estimate," she said. In addition to Barnett-Johnson and Grimes, the coauthors of the paper are Chantell Royer of Humboldt State University and Christopher Donohoe of the NMFS Santa Cruz Laboratory. This research was supported by the UC Marine Council and the Parnership for Interdisciplinary Studies of Coastal Oceans (PISCO). Note to reporters: You may contact Barnett-Johnson at (831) 239-8782 or barnett-johnson@biology.ucsc.edu and Grimes at (831) 420-3931 or churchill.grimes@noaa.gov.